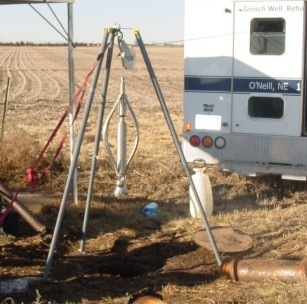 Our time tested methods of rehabilitation can often bring back production from older wells that have decreased in yield over the years. As you may already know there are many ways to rehabilitate wells. Organic acids are often used, but applying chemicals alone can be in some situations, a waste of money. At Grosch we are able to attack the problem using a variety of methods such as acidizing and surge block. Please feel free to contact us for information on how to revive your tired old well. Is your well not producing what it should? Our full color video camera produces an excellent view of wells 4 inches in diameter and larger. High intensity laps with variable adjustment light up the hole like daylight. Our system is capable of making VCR and DVD recordings for your video records. This is very useful in troubleshooting for well rehabilitation, checking integrity of well casing, or retrieving material from the well. Our line of rehabilitation chemicals remove both mineral scale, manganese, and bacteria build up. These chemicals are NSF approved organic acids which are safe to use and non-volatile. Grosch uses mechanical action to work the chemicals into the formation past the screen. This allows the chemical to open up more formation than by the backfilling method.